We've combined authentic Thai ingredients including chilli, coriander, lemon grass and lime to create a delicious stuffing for chicken pieces. 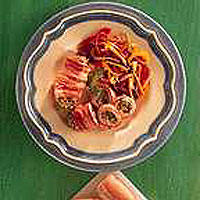 Serve the roulades with stir-fried vegetables tossed in hoi-sin sauce. In a large bowl, mix together all the ingredients, except the chicken fillets and bacon. Wrap each fillet in cling film and beat gently with a rolling pin to an even thickness so it is large enough to fill and roll. Place a little stuffing in the centre of each piece of chicken, roll up and wrap with two rashers of bacon, securing with a cocktail stick. Place the chicken roulades in a lightly oiled roasting tray in a preheated oven 200°C, gas mark 6, for 20-25 minutes or until thoroughly cooked.